The role of an enforcer is pretty simple in hockey, fight or you’re out of a job. 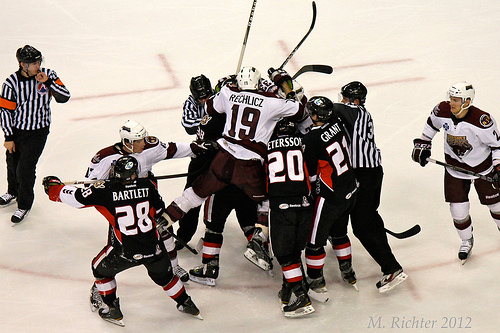 It’s a role AHL enforcer and former Hershey Bears forward, Joel Rechlicz is accustomed to. He’s not there to provide any defensive reliability or an occasional goal as part of the fourth line, Rechlicz is there to fight, just fight. With the Hershey Bears last season, he played in 44 regular season games and totaled one goal and one assist. His shifts were extremely limited, sometimes getting at most, five shifts per game. His impact on and off the ice didn’t go unnoticed however, as Rechlicz received high praise from his teammates and the endearing fans from Chocolate town. From a distance you could see the connection between him and the fans. He was always one to leave his lack of playing time at the wayside and just play as hard as he can when he got the opportunity. Rechlicz greeted fans after games near the locker room and showed a great appreciation of their overwhelming support. He was a great teammate, always supporting every player when they returned to the Hershey bench. Rechlicz made the most of his opportunities and his time in Hershey which landed him an NHL contract. This season, Rechlicz is playing for the Portland Pirates of the AHL, following his departure from the Washington Capitals organization this summer, when he signed with the Phoenix Coyotes. He signed a one year, two way contract with the Coyotes and will become a restricted free agent at season’s end. Rechlicz would definitely be a candidate for a call up to Phoenix following the lockout, especially if an enforcer at the NHL level were to suffer injury for any significant amount of time. Rechlicz previously spent time in the New York Islanders organization, totaling one assist in 23 games with newest NHL franchise set for a move, as the Islanders are set to head to Brooklyn in a few years. He has played in eight games for the Pirates this AHL season, registering 19 penalty minutes thus far. On Sunday, Portland visited Hershey and Bears’ fans saw Rechlicz in another uniform for the first since he left the Bears. Rechlicz got a chance to start the game, a first in his young hockey career. He received loud cheers at the beginning of the game, something many expected. Rechlicz talked to some of his biggest fans pregame, along with signing some autographs for the fans he once played for.